We interviewed students from East High School in Youngstown Ohio regarding their anti-bullying project. This group of students, led by advisor Jeanne Constantino, participated in Destination Imagination with their “Tree of Kindness” project. Destination Imagination is an educational program in which student teams solve open-ended Challenges and present their solutions at tournaments. It is project-based learning, and teams are tested to think on their feet, work together and devise original solutions that satisfy the requirements of the Challenges. D.I. Challenges are designed as a fun and engaging system of learning to teach creativity, the creative process, and interpersonal and management skills and help students achieve their highest potential. East High School’s team chose Project Outreach as their Challenge. They had to identify a real community need and design and carry out a Project that address the need. It included an impact prop, and the 8 minute skit had to be in the form of a fable. Anti-Bullying is their choice of the community need. Check out this uplifting story with an inspiring message of kindness. Feel free to julie@sprigeo.com if you would like to contact the student group from this video. 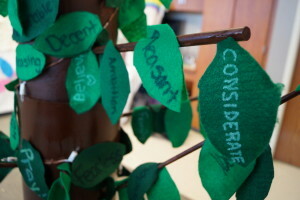 Tree of Kindness – Sprigeo Heroes from Sprigeo on Vimeo.